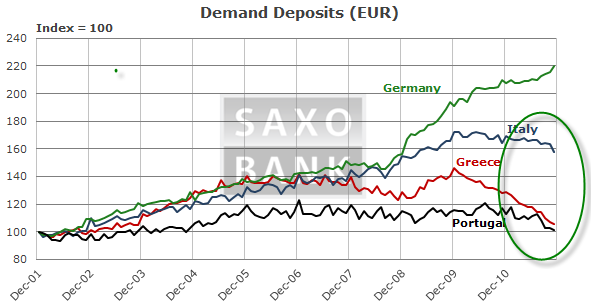 Via Email, here is a nice summary of European events from Steen Jakobsen at Saxo Bank in Denmark. Topics include the G20 Summit, Extend-and-Pretend Dogma, Capital Flight , and Geopolitical Risks. This week-end’s G-20 came and went without any real new information. Yes, the policy makers wants us to believe ultimately IMF will have 2 trillion US dollars at its disposal. No, the US, UK and rest of non-Europe is not really interested before we all get more clarification on how Europe will ring fence the debt crisis. This is more and more Wall Street vs. Main Street: Underfunded banks buys underfunded government bonds and underfunded governments guarantees underfunded banks. The real loser being the unemployed – Edward Heath put it more elegantly: Unemployment is of vital importance, particularly to the unemployed. Meanwhile the real economy and unemployment is exploding higher adding further burdens to already stretched government deficits. The new EU forecast for GDP growth in 2012 of minus .3% from this past Friday down from plus .05% is great example of how EU and the debt crisis non-solutions continues to lack behind fundamentals. Soon the rising disconnect will hit the politicians games of buying time. Chancellor Merkel is weaker, week after week. She soon will have to rely on SPD votes if she continues down this path. 62 percent polled over weekend are against giving more money to Greece and 2/3 don’t believe Greece can be saved according to German newspaper Bild. Finland will have an interesting vote this week. Follow it closely. The G20 did not give more credibility to more funds but they sure talked the talk of extend-and-pretend dogma. Crude: We are potentially a few weeks from some sort of confrontation unfortunately. IEA report from Iran is due this week. Israel’s time window is closing if you believe the media coming out of Israel. Iran’s finances are running out of time as well. Iran failed to pay for Indian rice last week. High energy prices will soon spill-over into gasoline and survey data and will start to impact data and sentiment negatively. Greece Controlled Default: Greece will have a controlled default and a vacation from Europe. Portugal CDS Spreads: Portugal is the real issue and containment is almost impossible. CDS spreads suggest the probability of default within five years is about 65 percent.